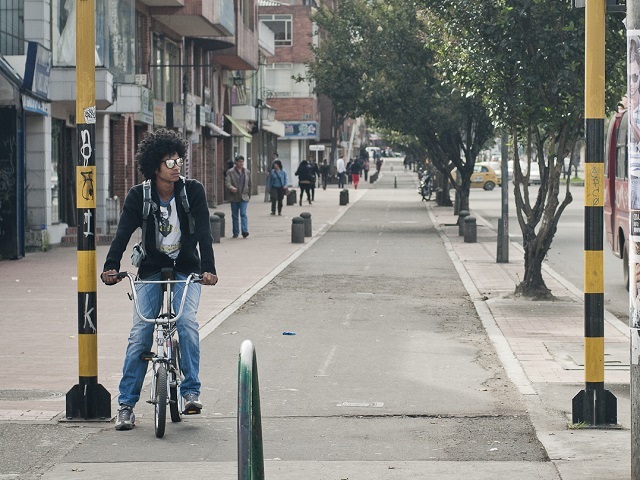 A man rides a bike in Bogota, Colombia. Sustaining a dialogue with the local community about local needs should be a priority for Habitat III’s New Urban Agenda. Photo by Juan Felipe Rubio/Flickr. Habitat III in Quito Ecuador this October will be an opportunity to galvanize local leaders to forge strategies for sustainable, equitable and resilient urban growth. But the stakes are high, and the conversation among policymakers and local leaders is still evolving around these interconnected challenges. On March 1, 2016 leaders from the US Department of Housing and Urban Development, the DC Department of Energy and Environment, the US Green Building Council, 100 Resilient Cities, C40 Cities, and World Resources Institute came together to discuss this ongoing dialogue as part of an event hosted by the Wilson Center, Next City, and Georgetown University. Spanning public policy, emissions reductions in cities, resilient design and more, the event examined the road toward a New Urban Agenda—the outcome of the Habitat III conference in Quito. Four areas of focus emerged during the discussion: the need for regional-scale thinking and solutions, a focus on equity, greater public-private cooperation and long-term community engagement. Many challenges, like climate change, go beyond city boundaries. As many regions continue to urbanize worldwide, there is greater need for broader-scale collaboration on resilience and climate. Risks often exist on a regional scale, and must be dealt with at a regional scale. However, Jess Zimbabwe, Founding Director of Rose Center for Public Leadership in Land Use at National League of Cities, noted that current institutional structures do not incentivize local governments to work together. Broadening the scope of local policies and tackling challenges through a regional lens will be necessary for a comprehensive approach to a sustainable future. On a city-to-city basis, networks of cities are enabling urban leaders to share technical knowledge and collaborate on strategies for scaling. As Brendan Shane, North America’s Regional Director for C40 Cities—a network of sustainability-minded municipalities—noted, “none of these cities are going to get to a solution by themselves.” A focus on city-to-city collaboration and greater awareness of regional risks and solutions will be crucial for Habitat III and the New Urban Agenda. By mid-2015, the number of global refugees exceeded 20 million, surpassing all previous records of forced migration. Many of these refugees have ended up in urban areas. Widespread urbanization has also caused, in absolute terms, a major upswing in the number of individuals residing in slums, bringing the total to 889 million by 2020. Habitat III will provide an opportunity to align the interests and priorities of urban housing, social equity and long-term sustainability in a single dialogue. According to Maxwell Young of 100 Resilient Cities, “formalizing informal communities, [and] making sure these informal communities don’t spring up in the first place,” will prove a challenge, particularly in developing countries. Young pointed to the example of Medellin, Colombia, where improved property rights and a cable car system helped recognize and successfully integrate the informal settlements into the city. Jess Zimbabwe added that alongside the San Juan Estuary in Puerto Rico, where informal settlements of over 70,000 dealt with heavily polluted water for many years, a coordinated land trust helped enhance cooperative land governance and improve quality of life for residents. Many public sector agencies are skeptical of private sector engagement when it comes to infrastructure. According to Jess Zimbabwe, public officials are often concerned about the thoroughness of risk evaluation from private sector solution providers—particularly with crises like those in Flint, Michigan. Distrust of the private sector often hampers collaboration. However, making room in municipal and regional policy for public-private partnerships will be necessary going forward. Tommy Wells, Director of the Washington, DC Department of Energy & Environment, noted that this type of collaboration can be done right, citing the success of 100-year green bonds issued for D.C. Water. Brendan Shane also noted that “private equity money is not flowing enough” into sustainable urban projects. C40 Cities, however, is taking a step to remedy this with a new Climate Finance Facility built in partnership with the German government and the Inter-American Development Bank. By providing strategic technical assistance, the initiative will work to establish greater public-private interaction for financing sustainable urban projects. Enabling cities to leverage opportunities for financing sustainable infrastructure should be a priority for the Habitat process. Habitat III provides a chance to set the stage for multi-stakeholder engagement, lighting the way for a global dialogue among solution providers, civil society and sub-national and national governments. Cities will need to maintain open lines of communication at the community level in order to incorporate needs and local voices into the development of long-term urban planning. A new paradigm of continuous community engagement the city level is necessary. Maxwell Young noted that participatory budgeting, like Porto Alegre’s model, can be a step forward, with integrated solutions emerging from a diverse set of stakeholders. Jess Zimbabwe noted that funding projects at the neighborhood or community level is also particularly helpful in maintaining local connection. For example, Seattle’s Department of Neighborhoods, recognizing that economic growth is not reaching all parts of Seattle equally, launched an initiative to fund projects at the neighborhood scale, including resilience-focused initiatives like the Rainier Beach Disaster Preparedness project. Habitat III will provide a space for creating a New Urban Agenda that will help define the future of global cities. Ensuring a strong outcome will require that we emphasize the power of regional networks, address urban inequality, find innovative partnerships for sustainable projects and consistently engage communities to develop local solutions.